"A wizard is never late. Nor is he early, he arrives precisely when he means to!" There are so many cool sounding parts to being a wizard, we're getting lightheaded just thinking about them! But, showing up perfectly on time, every time, definitely takes the cake. 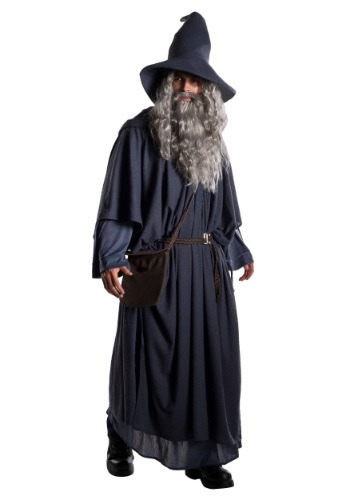 If you are an aspiring wizard, or just a huge Lord of the Rings fan, you'll need this Premium Gandalf Costume if you plan on showing up to a party on your own time. If we had a chance to chat and smoke our pipes with Gandalf, we'd have so many questions for him. Is he a man with supernatural powers, or a super-man that looks like a weary old traveler? Does he choose to dress like a hobo every morning, or is it some kind of wizard dress code? How does he keep his beard so soft and leaf-free (it's gotta either be magic or a really nice comb), and does he ever hide stuff in it? Eventually, we'd get around to asking if he always knows exactly when he's going to show up, or if he just looks so intimidating that nobody has the guts to call him out on being late. Since these are high quality dark grey robes, and not something from a wizard's garage sale, they will make you look very intimidating, and you won't be mistaken for some conjurer of cheap tricks. It's the perfect costume for showing up fashionably late!